Palavras-chave: Frantz Fanon; sociogênese; colonialismo; racialização. autor ao longo de sua trajetória teórica. BHABHA, H. The location of culture. New York: Routledge, 1994. BHABHA. “Day by Day... with Frantz Fanon”. In: Alan Read (Ed.). The fact of blackness: Frantz Fanon and visual representation. Seattle: Bay Press, 1996, p. 186-205. BIRD-POLLAN, S. Hegel, Freud and Fanon: the diabetic of emancipation. London and New York: Rowman & Littlefield International, 2015. (Creolizing the Canon). BRENNAN, Timothy. Apuestas subalternas. New left review, n. 89, 2014. BURAWOY, M. O marxismo encontra Bourdieu. Campinas: Unicamp, 2010. BUTLER, J. Undoing Gender. Minneapolis: University of Minnesota Press, 2004. CHOW, R. Female sexual agency, miscegenation, and the formation of community in Frantz Fanon. In: Alessandrini, A. FRANTZ FANON: critical perspectives. London and New York: Routledge, 1999. CROWELL, J. Marxism and Frantz Fanon’s Theory of Colonial Identity: parallels between Racial and Commodity-Based Fetichism. Scientifica Terrapin, 2011. DUNAYEVSKAYA, R. Philosophy and revolution: From Marx to Mao and from Hegel to Sartre. Detroit: News and Letters, 1989. FANON, F. Peau noire, masques blacs. Editions du seuil: 1952. FANON. Pour la révolution africaine (écrits politiques). François Maspero: 1964. FANON. Les damnés de la terre. Paris: François Maspero, 1968. FANON. Em defesa da revolução africana. Lisboa: Sá da Costa, 1969. FANON. Pele negra, máscaras brancas. Salvador: Edufba, 2008. FANON. Os condenados da terra. Juiz de Fora: UFJF, 2010. Sociologia da UFSCar. São Carlos-SP, 2015. Self-Knowledge, v. Special Double-Issue, Summer 2007, p. 33-44.
and thought. Fordham University Press Publication, 2015. HALL. The work of representation. In: HALL, Stuart (Org.). Representation: cultural representation and cultural signifying practices. London/Thousand Oaks/New Delhi: Sage/Open University, 1997.
visual representation. Seattle: Bay Press, 1996. Amilcar Cabral. Lanham, MD: Rowman & Littlefield, 2009.
decolonization. Lanham, MD: Rowman & Littlefield, 2010. RABAKA. Revolutionary fanonism: on Frantz Fanon’s modification of marxism and decolonization of democratic socialism. Socialism and Democracy, v. 25, 2011. ROBINSON, C. The appropriatton of Frantz Fanon. Race and Class, v. 35, n. 1, 1993. ROBINSON. Black Marxism: the making of the black radical tradition. The University of North Carolina Press, 2000. ROLLINS, Judith. ‘And the Last Shall Be First’: The Master-Slave Dialectic in Hegel, Nietzsche and Fanon. Human Architecture: Journal of the Sociology of Self-Knowledge, v. 5, n. 3, 2007. SEKYI-OTU, Ato. Fanon’s dialectic of experience. Cambridge, MA: Harvard University Press, 1996. SEKYI-OTU. Fanon and the possibility of postcolonial critical imagination. University of Ghana, Legon, 2003. WYNTER, S. Towards the Sociogenic Principle: Fanon, The Puzzle of Conscious Experience, of “Identity” and What it’s Like to be “Black”. Collection of Essays National Identity and Sociopolitical Change: Latin America Between Marginizalization and Integration. University of Minnesota Press: 1999. FAUSTINO, D. Frantz Fanon:. 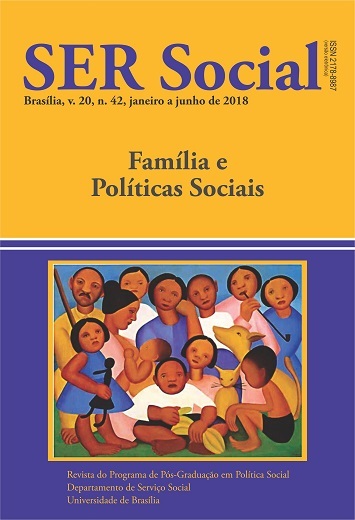 SER Social, v. 20, n. 42, p. 148-163, 15 jun. 2018. Co´pyright: Os autores serão responsáveis por obter o copyright do material incluído no artigo, quando necessário. Excepcionalmente serão aceitos trabalhos já publicados (seja em versão impressa, seja virtual), desde que devidamente acompanhados da autorização escrita e assinada pelo autor e pelo Editor Chefe do veículo no qual o trabalho tenha sido originalmente publicado. SER Social de Departamento de Serviço Social - Universidade de Brasília é licenciado sob uma Licença Creative Commons Atribuição-Uso não-comercial-Vedada a criação de obras derivadas 3.0 Unported. Based on a work at seer.bce.unb.br.